N. Tesla invents what would become a standardized physiotherapy practice termed diathermy. "The currents furnished by them have proved an ideal tonic for the human nerve system (...) allay all kinds of suffering and save annually thousands of lives. Leaders in the profession have assured me that I have done more for humanity by this medical treatment than all my other discoveries and inventions." The soirées of N.Tesla at his lab in South Fifth Avenue, New York, with guests such as Mark Twain, J.P. Morgan, J.D. Rockefeller etc. His lectures in London and Paris. [page 47 – Chapter 5 “Lionized and Ionized”]. The inventor's relentless need for research funding, in addition to his love of display, inspired him to invite the wealthy and the famous to his laboratory for after-hours entertainement. Dashing and debonair, he fit well into high-fashion New York society. But his personal side was complex, often as difficult to understand as his electrical inventions. To Tesla's laboratory came such figures as J.P.Morgan, John D. Rockefeller, Edward H. Harriman, Thomas Fortune Ryan, Jay Gould, the Astors, the Vanderbilts, and later even Henry Ford. Among those who bravely posed with high-voltage sparks pouring from their bodies were the actors Joseph Jefferson and Marion Crawford, the director of the Boston Symphony, celebrated prima donnas and even occasional kings and queens. [page 58] Perhaps Tesla's most famous friend was the writer Mark Twain, with whom the Serb's literary connections went back to childhood. (...) Mark Twain was one of the friends most often invited to Tesla's laboratory for the improvisational shows of fright and delight. On one particular evening Twain himself inadvertently furnished the entertainment when he insisted upon experiencing the gyrations of a platform mounted on an electrical oscillator. Tesla pretended to dissuade him, which of course made Twain all the more desirous of prolonging the test. Once on the machine he kept saying. "More, Tesla, more!" But soon he was crying for help, since an undesired effect fo the oscillations on the human body was to create a turmoil in the bowels. Twain on the left, Tesla on the right. [page 84] Tesla arrived in London on the 26th January 1892. "Tesla's plan was to speak before the Institution of Electrical Engineers a week later "and leave immediately for Paris" to lecture before the Societe Francaise des Electriciens." [page 85] After a few days of enjoyable company and a tour of London, Tesla relaxed, and on Wednesday, February 3, his discourse, entitled Experiments with Alternate Currents of High Potential and High Frequency, was presented. 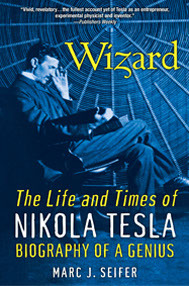 "For a full two hours, Mr. Tesla kept his audience spellbound" (...). [Page 88] Having seen the inventor handle such enormous voltages "so unconcernedly", many of the attendees mumbles surprose among themselves and gathered the courage to inquire how Tesla "dared to take the current through his body." "It was the result of a long debate in my mind, "Tesla replied, "but through calculation and reason, I concluded that such currents ought not to be dangerous to life any more than the vibrations of light are dangerous...Consider a thin diaphragm in a water-pipe with to and for piston strikes of considerable amplitude, the diaphragm will be ruptured at once,", the inventor explained by analogy. "With reduced strokes of the same total energy, the diaphragm will be less liable to rupture, until, with a vibratory impulse of thousands per second, no actual current flow, and the diaphragm is in no danger of rupture. So with the vibratory current." In other words, Tesla had increased the frequency, or alterations per second, but reduced the amplitude or power greatly. The wizard thereupon fired up the coil one again, sending tens of thousands of volts through (or around) his body and illuminated two fluorescent tubes which he held dramatically in each hand. "As you can, see, "Tesla added, "I am very much alive". "That we can see", one member responded, "but is there no pain?". "A spark, or course, passes through my hands, and may puncture the skin, and sometimes I receive an occasional burn, but that is all; and even this can be avoided if I hold a conductor of suitable size in my hand and then take hold of the curent". "In spite of your reasons", another concluded with a shake of his head, "your speculation resembles to me the feelings that a man must have before plunging off the Brooklyn Bridge". [Page 92] Tesla crossed the English Channel during the second week of February and booked a room at the Hotel de la Paix. At his upcoming lecture "before a joint conference of the Societe de Physique and the Societe International des Electriciens", the inventor sought out the well-known French physician Dr.d'Arsenoval, a pioneer in the field of diathermy. Tesla said later: "When...Dr. d'Arsenoval declared that he had made the same discovery (concerning the physical effects caused by sending extremely high frequency through the body], a heated controversy relative to priority was started. (...) Resolved to take steps for vindicating my claim, I met [with] Dr. d'Arsenoval. His personal charm disarmed me completely and I abandoned my intention, content to rest on the record. It shows that my disclosure antedated his and also that he used my apparatus in his demonstrations. The final judgement is left to posterity. Since the beginning, the growth of the new art (of electrotherapy)...and industry has been phenomenal, some manufacturers turning out daily hundreds of sets. Many millions are now in use throughout the world. The currents furnished by them have proved an ideal tonic for the human nerve system. They promote heart action and digestion, induce healthful sleep, rid the skin of destructive exudations and cure colds and fever by the warmth they create. They vividly atrophied or paralyzed parts of the body, allay all kinds of suffering and save annually thousands of lives. Leaders in the profession have assured me that I have done more for humanity by this medical treatment than all my other discoveries and inventions." (On other scientists that have used electrical currents for tissue regeneration: "Having studied regeneration capabilities of such reptiles as salamanders whose tails were amputated, Becker has discovered that these animals generate a particular electrical frequency which serves somehow as a field for promoting the total regrowth of the missing appendage. By "artificially duplicating" the signal, Becker reports, "we have been able to produce partial limb regeneration in [mammals such as] rats by a similar technique, and some clinical applications are under study in human beings at this time"). The Paris lecture ignited "the French papers...[with Tesla's] brilliant experiments. No man in our age has achieved such a universal scientific reputation in a single stride as this gifted young electrical engineer", the Electrical Review reported. [page 50]: Tesla first met Bernhardt in Paris in 1892. He was relaxing with friends in a sidewalk cafe late in the evening when the actess passed by them. In a flirtatious gesture of the times she dropped her handkerchief. Tesla sprang to his feet and returned it to her, and a bond was instantaneously formed between them. Bernhardt is later said to have attended one of his lectures in America, raising speculation among their friends about a secret tryst.